I can’t tell you how much we appreciate all that you do. "The band truly WOWED the crowd. We received an unreal amount of compliments. John has a sense of knowing exactly the songs the guests are vibing to and chooses the best music to keep up the momentum. They were kind, professional, excellent with communication and sounded amazing. He really made everyone feel at ease and have the best time dancing"
We had John's full band at The Duquesne Club for 250+ people. Some of the guests were from Washington DC and NYC-- they loved John and said the band was better than any band they had heard before -- AND I AGREE !!! John Parker and Band are not only extraordinary musicians but the ultimate professionals in the music industry. John's attention to details and service are second to none. He had everyone up and dancing the entire evening. I highly recommend them!! WE LOVED EVERYTHING!!!! You were the star of our show!! YOU ROCKED IT!!!! - And that 1st dance arrangement?!??? ...I mean, PERFECT!! Thank you so much for all things professional and personal that left your unique touches on our unforgettable wedding day. Hit us up when you're in Chicago!! THANK YOU!!! You guys were amazing! People are still talking about it! What a fun party! ...Trent and I had a blast! John- We have returned from Belize, but are still trying to believe that everything really happened. Every conversation that we have with friends and family who were in attendance involves you and your band. You all were really incredible! We can not wait to see the videos and the photos to relive that night. Thank you so much for everything, wishing you the best! "We had a great time at the wedding! You did a fabulous job along with the other talented musicians! It was so much fun. Heard many compliments about your work. Thank you for your professionalism. I'm not sure how you do it all the time though. We have been exhausted this past week. Whenever we talk about the wedding, your music comes up and we are so happy that you were a part of our day. "I have never seen our group so excited with lots of our guests staying at the party to the very end ... Begging you to play more. You and your band were absolutely wonderful. The range of different songs you are able to play is amazing. You really helped make our final formal evening a huge success!!! I really hope we are able to have you return. Hopefully, we will be able to hear you again before our next conference.. Thank you so much!" "John Parker Band is the absolute BEST!! From the first song to the last song, the dance floor was packed! So many guests kept coming up to us commenting on how great the band was! 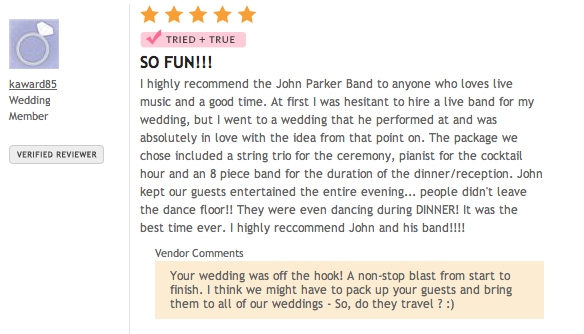 John was so easy to work with and helped ensure there was a good flow to the reception and maximized dancing time. 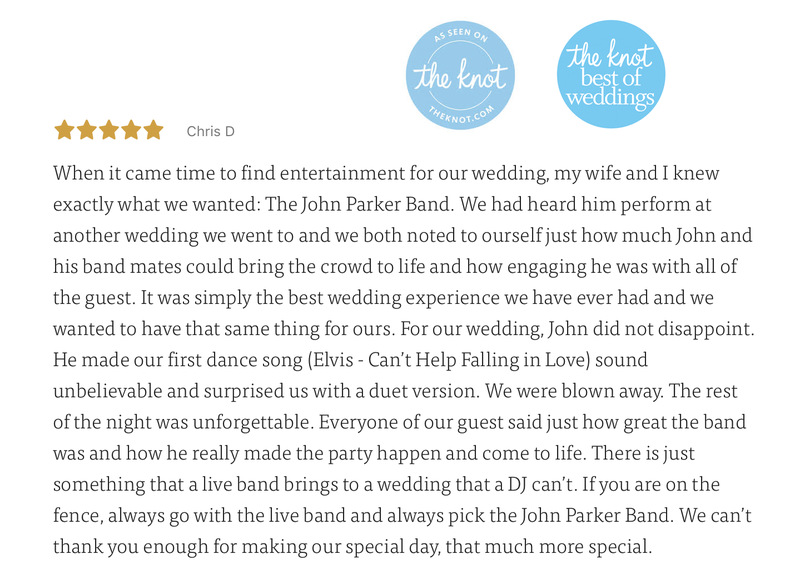 We could not recommend John Parker and his band enough! Just book them...you won't be disappointed!" "My guests rave about two things about my wedding, my Bride.. and John Parker!! By far the easiest vendor for us to work with, John is well mannered, very conscientious & a consummate professional. He was always available for calls, questions and returned emails quickly. Oh, and his band is the BEST. His performance kept the dance floor humming all night. Great mix of the classics and brand new top hits all mixed with our requests. He also handled the music for our ceremony, cocktail hour and played emcee. A++++"
"It isn't a party without John Parker!" Thanks so much to you and the band. Everyone had an amazing time and your band was the perfect addition to the night. You all sounded great! I look forward to the next time our path's cross. Thanks again! "...Thank you so much for providing the music on our special day! We had so many people asking about you and where we found you. You did a great job at keeping the energy up and leading us through all the moving parts of the reception. "WOW, is all I can say! Our party was a hit because of you and your band---you guys really were the best band we, and our guests, have seen. We had a lot of people come to us (and call us afterwards) and tell us so! Thanks again and if there's a review I can write for you, I'd love to!" "...Thank you John. You guys were phenomenal. You set the tone from the start. We knew from the beginning that even if everything else didn't work out,the band would be great!. I know people will be calling you to play for them after seeing you Saturday. Thanks again for being a big part of a special day for us all..."
"Thank you so so much for making Luke and my wedding such an incredibly wonderful day. Everyone we talked to had a wonderful time and absolutely LOVED the music from the band. We were so happy with how everything worked out and I will be sure to write up a review soon here too for you. Wishing you all the best, Christy"
You did a great job and I bet you will receive a lot of referrals. You could not have done a better job and been more professional. The most asked question that I was asked was "How did you find such a fabulous band". "We ALL had such a wonderful time we can't thank you enough !! We will never ever ever forget what you did for us on the wedding night! You and the band are always so classic we just love your music ! You can contact our reviews! - many other bands' "reviews" are written by the bands themselves, & promoted by websites that SELL them advertising on big wedding vendor sites. Sad, but true. 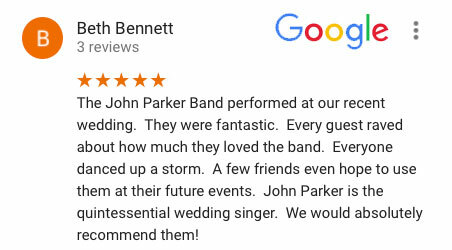 as in 100% of them!because the reviews you see here are REAL John Parker band clients who YOU can call or email to talk to about how the JP band made their wedding, party, or gala great! JP has no "twin" or "lookalike" These days, many so-called "bands" are just companies that send out different musicians using the SAME band name for different events all across the country! - so a review for them means literally nothing because you have NO idea exactly who YOU will be getting. Does that seem good? Not to us. Need someone professional, experienced, dependable & AWESOME that you can COUNT on? - JP was personally at EVERY event reviewed here, & John will personally be at YOUR event too! With most bands you really don't know WHAT you're going to get. With John Parker - you DO! 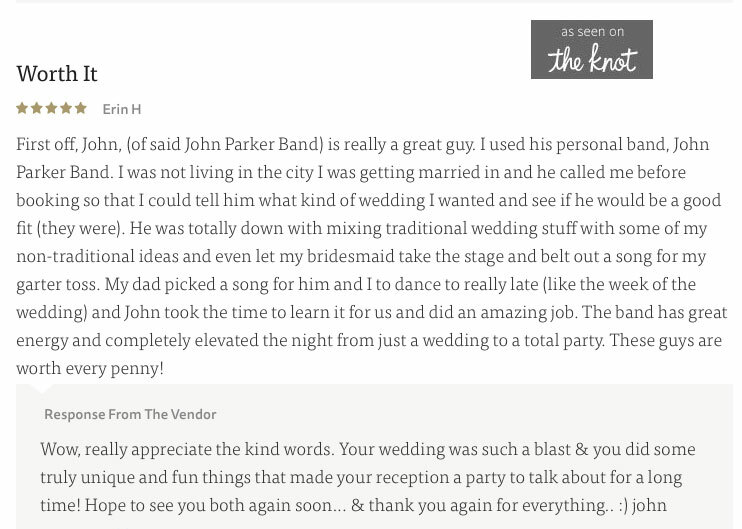 "I just wanted to thank you for the amazing job you and your band did for our wedding. You guys were absolutely perfect, amazing, wonderful and fun. If not for you guys, the wedding reception would of been a total disaster. We just wanted to say, that we can't thank you enough and you guys were Awesome !!! "You guys were absolutely fabulous!! You all were everything and more and you made our wedding day truly the most fun day of our lives. Everyone loved you all and you were the talk of each day after (even the 4th party we had). I will tell everyone to go give you all 5 stars & honestly you deserve more. Many many thanks and hope to see you again!" – our friends and family are still talking about how fabulous your band was. As my dad mentioned to you on our wedding night, you were honestly the first vendor we called after we got engaged because we knew you’d create an awesome party atmosphere!" Thank you again & all the best! Nina & Jake"
"I want you to know that we were 100% thrilled with the JPB - could not have been happier. You are so talented - you totally nailed every song that you sang -you were unbelievable! Perfection! I was blown away right out of the gate. I think I told you the night of the wedding but again, every guest I spoke with was like, “where did you find that band?” or “That band is fabulous” So much positive feedback. Thank you so much - it truly is the band that controls the energy and makes a party! Well what a party it was. Thanks also for being so professional, I’m sure glad we booked you first!! I sure hope we get to see you at another wedding soon.."
We loved having you at the Hospital Aid Society Gala ! You and your band were simply the best ! Thank you so much for making out event so special and fun !! Your band was amazing and every guest is still talking about how wonderful you were. You made our wedding! You exceeded our expectations. We did not want it to end. I would like to give a testimonial or review on how spectacular you were. My husband and I feel so good because our friends are telling us “ it’s the best wedding we have ever been to”! 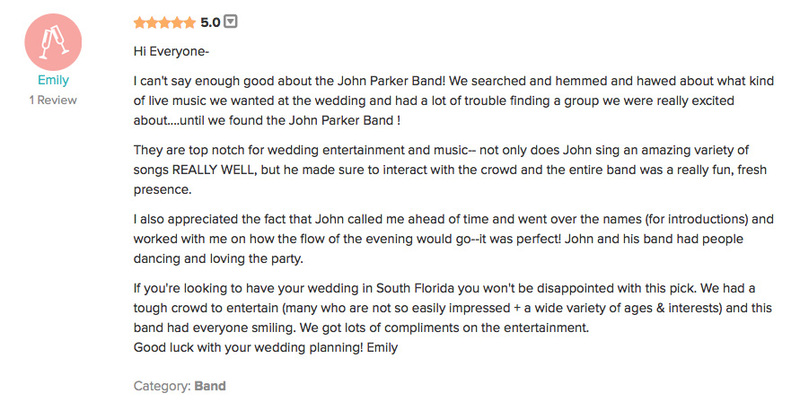 "We have received SO many compliments on the band! You and your team were unbelievable. We are so happy we were able to have you at our wedding. You truly outdid yourself and turned our wedding into an unforgettable event. 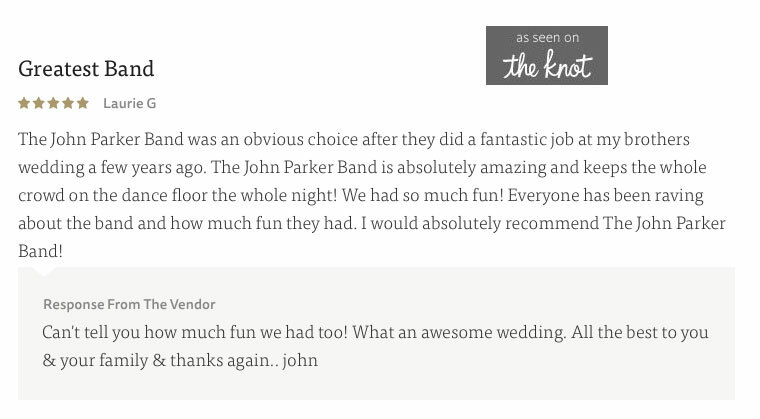 "We had SUCH a blast at the wedding and absolutely loved having you and the band there! Our friends and family raved about how amazing you were and we thought the same. "Thank you so much for putting on an amazing entertainment for our guests. I keep getting so many compliments of how good the band was. You guys are truly awesome! I'm glad to hear you also had a great time! Thanks for letting my brother sing us a song:) He's so wonderful and it was such a special gift! Thank you again, I will be recommending you guys to everyone that is having a wedding! "..it was excellent! 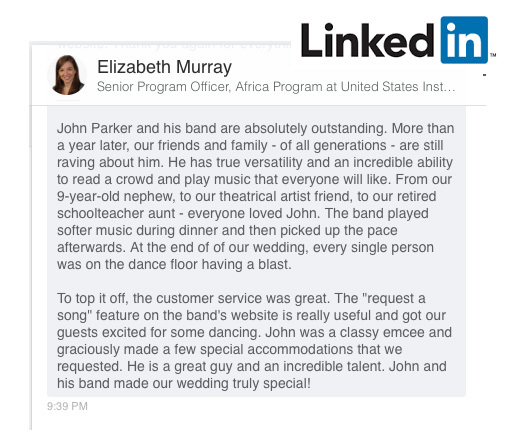 We were very pleased with how you worked with us from the beginning to get our first-dance and parent dances just right. We were also so impressed with the musicality and professionalism of John and the band. Some requests were made right on the spot and John was able to transition right into these special songs. John also kept the night moving smoothly as a great emcee. Overall, we couldn't be happier. You made our special day even that much more special. We are very grateful for all of the hard work and dedication you put into our evening." "You and your band were terrific at the St. Joe's Gala last night"
.....giving the auction updates etc, etc, etc. " 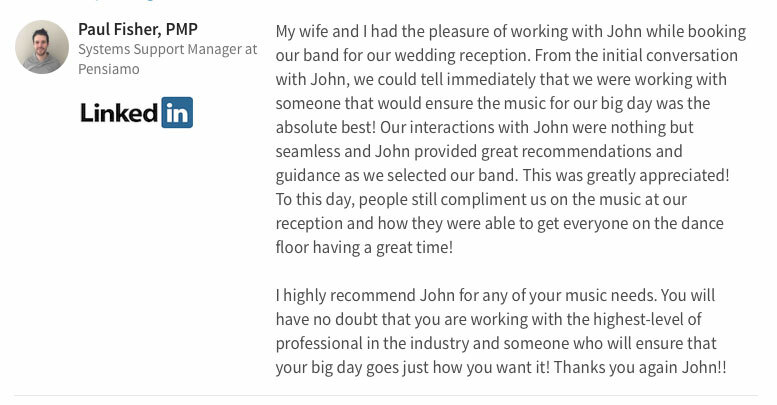 "John, Thanks to you and your band for playing our wedding. It would not have been as much fun as it was without you all! Everyone has commented to us on how much fun they had and how much they enjoyed the band. We really appreciate everything you did to help us with the wedding. It was perfect! " "John! Everything was great and definitely exceeded our expectations! 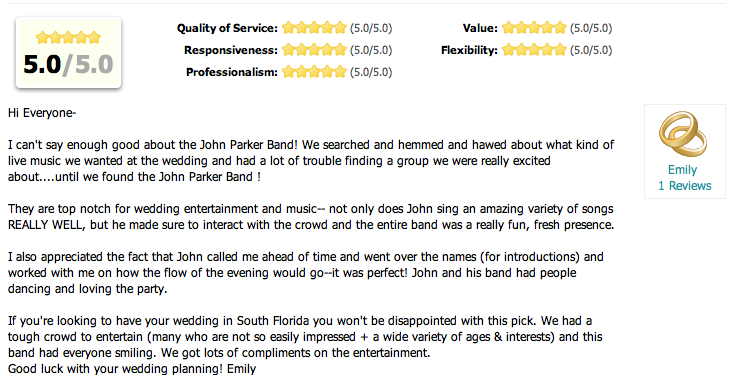 Our guests were so impressed - many even said they wished John performed publicly so they could go watch the band again! We never had so much fun in 18 years of doing this event. What a difference having John Parker made. 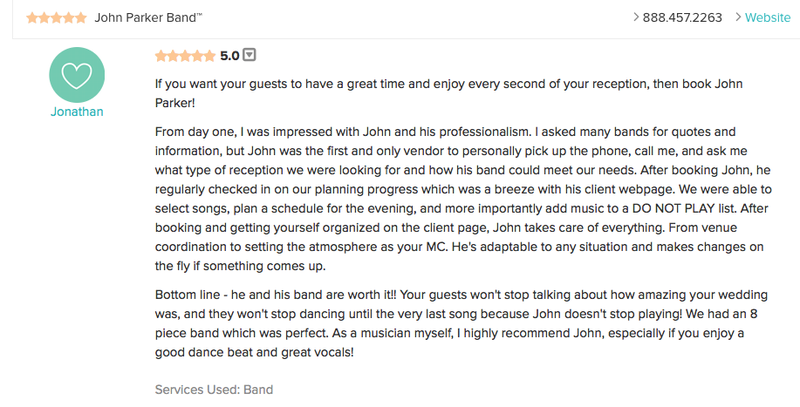 We received rave reviews about John all night long. Absolutely fabulous! We’ll begin planning for next year with you in about 2 months,"
"...We had a great time, John. Our friends were just raving about you. Thanks again for an awesome evening!.." "... we had an amazing time and our friends LOVED the music!..." 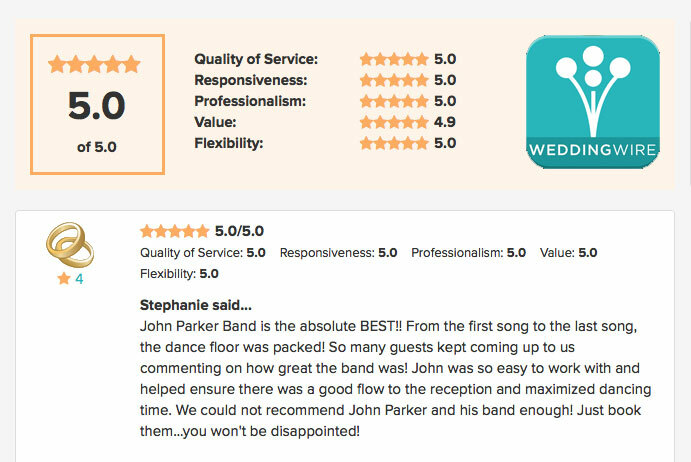 "John - cannot tell you how many inquiries we fielded about you and the band - you MADE the wedding. In particular, your range going from Neil Diamond to Motown to Italian Opera, in Italian and then all the great dance music. Thank you for making the wedding an over the top success!" handwritten letters, emails & website posts containing the referenced quotes below! “We have never had a party last that long.. how do you keep them dancing like that?“-Joseph Congedo, Abbott Laboratories, Inc.
“the total package you present is extraordinary- from creation, technical, business management to performing” Charles Zappala, R.R.Z.&G Holdings, Inc.
“Not only do I appreciate your considerable talent, I know that I can count on you to be professional and extremely reliable.. that reduces my anxiety level on what are usually stressful evenings”-Joan C. Rozzo, D.D.F.&M. “Mr. Parker and band are superb in every aspect– talent, professionalism & character. On behalf of the Medical Staff, thanks for another great evening!”- Elaine Davies, U.P.M.C. “Your performance, as well as your dedication and professional approach to your work, is amongst the finest I have ever seen!… you are a phenomenal musical talent!!! We look forward to your next appearance!”- John E. Thomas, President, Fez Food Service, Inc.
"..You and your band were FANTASTIC! You sounded great, and you were a pleasure to work with. "I knew the band I picked would make or break a good wedding. Your name was brought up every time I asked anyone involved with weddings. John, it is impossible for me to thank you enough, nor is it possible for me to describe in words how absolutely great your performance was. other than to say YOU MADE MY DAUGHTERS WEDDING EVERYTHING WE HOPED IT WOULD BE AND MUCH, MUCH MORE !!!!!..." "What a wonderful treat to have you perform at our wedding. You and your fellow musicians were magical, fun, and brilliant! Every song was perfect and so much fun. 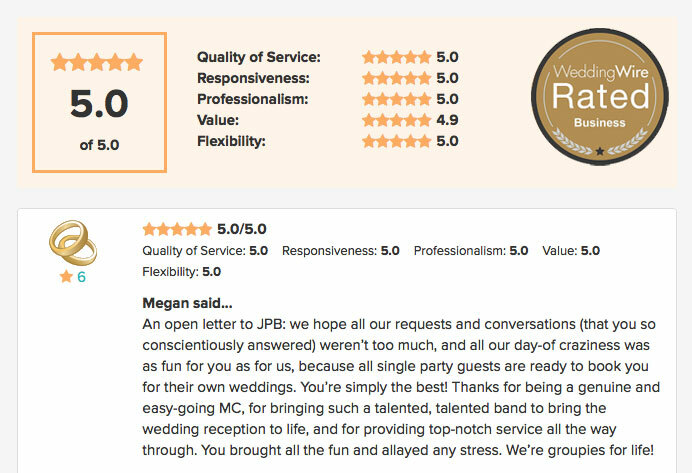 My goal was to have our guests say it was the best wedding they've ever been to, and you helped to make that happen. Thank you for taking the reins and helping the night to unfold seamlessly! We will never forget the John Parker Band! "The evening was quite a success! I will pass along all the information from everyone who participated in the Ball this year to next year's chairs. You were absolutely wonderful to work with and I am most appreciative!" to see if JP is available for YOUR event!